Felt floral artist Misty Higgins designs beautiful keepsakes. Misty Higgins’ daughter Zoe models a felt floral headband. Higgins, a Texas native and Notre Dame graduate, always had a fascination with flowers and an itch to be creative. “As soon as I got started, I was hooked,” she says. Through experimentation, she taught herself how to be a wool felt florist. She learned to replicate the intricacies of flowers by visiting farmers markets, studying the components of real flowers—shapes, colors and variations—even bringing flowers home to dissect. “I started making all of this stuff and realized I can’t keep it all,” she says with a laugh. She applied for a license, figured out how to become a small business, and launched Heartfelt Blooms, opening her Etsy shop two years ago. The artist has built a reputation for adorable pieces that are oh so swoon-worthy. Higgins masters the art of felt flowers by sourcing only quality wool or wool blend felt and paying attention to lifelike details. Most of us automatically think of the acrylic felt you find at craft stores. “Acrylic tends to be shinier, rougher, it doesn’t bend as easily as a wool felt does,” she explains. “Wool felt tends to be very smooth and very soft. It definitely is more expensive than acrylic felt but the investment is worth it. 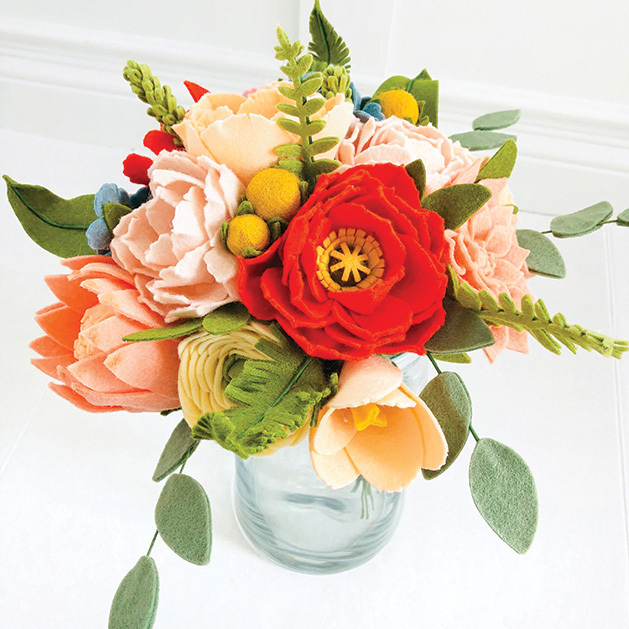 You get a much different product.” She designs her blooms using wool felt, felt balls or hand-dipped stamens, a glue gun and glue, and quality scissors. Higgins says people appreciate her attention to detail. Not only has she studied the shape of individual petals, she pays special attention to the ways they curl. “Wool felt doesn’t hold a bend so a lot of times I’ll create shape and movement by the way I cut the flower as well as gluing in just the right spots so that it has bend and has a lot of fluidity to it,” she says. When she can’t recreate a center with felt, she’ll often replace it with hand-dipped beads to replicate stamens. Even the edges of petals are not perfect, so she makes slits to enhance the look of jagged edges and provide texture. She’s particular about not being able to see the glue. “You have to understand how a flower is structured in order to know where to place the petal and where to place the glue so that it curves the way you want it. For instance, roses tend to curl at the ends. If you think of a peony, they will curl to the inside toward the center of the flower, where roses tend to bend outward and getting that bend is extremely difficult with felt,” she says. She accomplishes the bend with either strategic cuts or strategic placement of glue. But the glue is the deal-breaker for Higgins. “If you see the glue, you lose the magic. For a minute I want people to think this is a real flower,” she says. 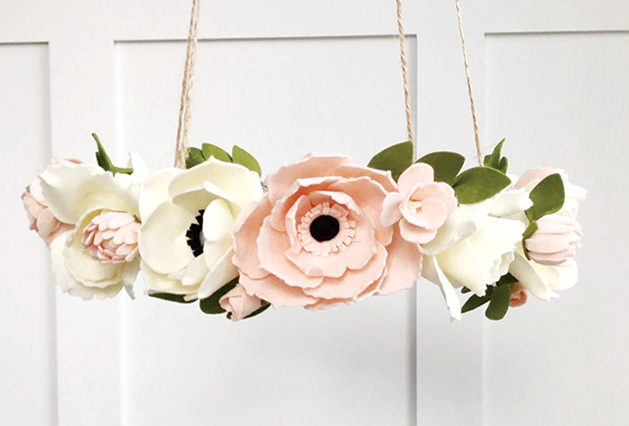 Browse through Heartfelt Blooms on Etsy and you’ll be inspired to throw a party, get married, have a baby and decorate a nursery or take family pictures. From garland around high chairs for photo-ready baby’s first birthday smash cakes, to girly headbands, Higgins has been invited to create keepsake heirloom pieces like wedding bouquets and boutonnieres, prom and homecoming corsages, maternity sashes, and daddy and daughter dance boutonnieres with tiny matching bouquets. Her two most popular creations are crib mobiles and milestone hoops for baby’s first year. 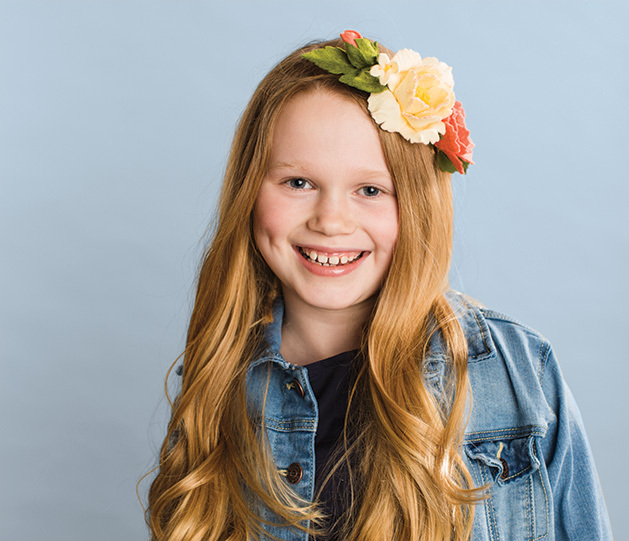 She makes a ton of different felt crowns or blooms, such as the wildly adored unicorn, fox and bunny ears that sell extremely well before Halloween and birthday parties. You don’t need a special occasion to be the owner of a Heartfelt Bloom design. Higgins taps into her interior design talent, designing custom floral garlands and hoops. 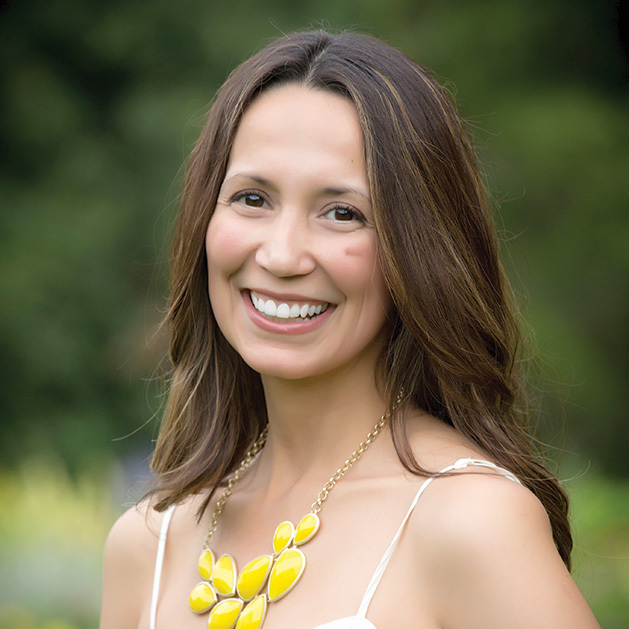 This Edina mother of two has a fulltime corporate career so she is intentional about a healthy balance between work and family. She sometimes puts her Etsy shop on vacation so she can get orders out within the timeline she promised. Higgins says her husband has been wonderful. “During my busy seasons he will sometimes pitch in and help me. He’s always supportive, sometimes I’ll ask him for advice, and he’s been very thoughtful in his time and encouraging words. My kids love it and they ask me to make them stuff all the time,” she explains. Higgins experiences challenges, but mostly related to time, not the craft. “I feel like I never have enough time to do as much as I can dream of. I have a laundry list of ideas in my head that I can’t wait to get to come to fruition,” she says. She wants to master a bouquet that looks organic. She finds inspiration at farmers markets, in books and Instagram pictures of flower farms and wedding bouquets. When she’s finished with an order, she writes a note to her customer, conveying to them she hopes they love their item and asks for feedback. She says it is most satisfying to hear and see how they’ve used it in their lives. “I love getting all the little adorable pictures of babies with my headbands or seeing a bride walk down the aisle with my bouquet, just seeing a little glimpse into their lives and how Heartfelt Blooms was a part of it. It’s so fun and so rewarding,” she says. Recently a daughter asked Higgins to create a bouquet of brightly colored flowers for her mother who is in the early stages of Alzheimer’s. “It pulled at my heartstrings. I wanted to make it as special as I could, knowing she wanted to use it to connect the two on the days she couldn’t remember who her daughter was. But at least she would see it and see the note that her daughter loves her and was thinking of her,” Higgins says. Request a custom design or shop her listings on Heartfelt Bloom’s Etsy store.